Baker's Sprease baking release spray creates a non-stick coating on a variety of surfaces, including bun pans, bread pans, and muffin pans. Made with canola oil to handle high heat, this spray is free of fat, cholesterol, calories, and sodium. Plus, it's easy to use. Simply shake the aerosol can and spray a light coating onto the cooking surface to create a surface from which foods will release easily. The Baker's Sprease 16 oz. Baking Release is great for keeping cakes from sticking to the pan. It's also a good price for the size compared to others. I was pretty skeptical because we haven't found many oil based sprays that work well for us, but using this spray makes our cakes fall right out of the pan! This spray works better than the spray I get locally and it is a much better price. I seem to get everything here at Webstaurant store. Works great with our waffle cone maker. Our inside grills were bad about sticking at times so we switched release spray. This one has been positive so far without a lot of extra additives. I thought the bakers sprease baking release spray worked great. I used it on a pan extender and it pulled right of the cake with no problem. I have been looking for a good baking release. Unlike some releases that leave a after taste on your product this one does not Excellent product. This product is very good for baking. It can even be used in those non stick coated pans. This is better than using butter and flour which can be heavy and cause build up. i absolutely Love this Baker's Sprease 16 oz. Baking Release Spray- 6/Case. It's just as good if not better than the ones in stores, however, this is a lot more product for a fraction of the money. I am switching and sticking with this product going forward. I recommend this product is very light ,affordable price and the best SPRAY NEVER CLOGS ! perfect on cakes, cupcakes, breads, muffins, rolls, and more! Great for baking and simple to use. Just spray and bake and there will be no sticking! Very neutral flavor too and a little goes a long way. Perfectly perfect! We have been paying more for a much smaller can locally, and I was so pleased to see that Webstaurant offers this. Ordered and tried last week and it works great! ;;this product works fantastic for our very busy bakery department and is literally 1/2 the cost of comparable products. Highly recommend and it is oil based. i know this is "bakers" sprease, but it works perfectly fine with all sorts of cooking, not just baking. i use it all the time for meal prep sheet pan cooking and it's just as good as any other brand i've used. Good stuff. However we tested it against the Pan Sprease and really couldn't tell much difference. The Pan Sprease is cheaper too, so we are going that route. This spray does precisely what it’s supposed to do. Very pleased with the performance. “The gripper” patented seal worked beautifully in preventing any leakage in shipping. this product works just as well as the pan release from gfs or similar store brands. better value for your dollars spent. would purchase again . This spray is great! It is such a great value and has lasted me for quite a long time. I use it to spray all of my cake pans and have never had an issue with any of my cakes sticking to the pan when using it. I really like this spray. I started with an individual can to start with and ended up buying a case with my next order. It does bubble up somewhat on the sides, but I think it helps the cakes have less crumbs and easier to level. This spray works really well for baking pies. They help our pies not stick and are not super greasy, which a lot of sprays can be. Baker's Sprease is a great baking oil spray at a great price. The spray pattern is a nice and even, hasn't given me any clogging problems yet and does its job and gives easy release of baked goods. Good stuff I recommend it. This is by far the best baking release spray I have ever purchased. This Baker's Sprease baking release spray is up there with the most popular competitors. My baking products always came out perfect. Fantastic price for the amount of product you will get. I will definitely purchase these again. I love this product. It helps release items and does a great job. it does not have flour mixed in to my knowledge but still does a great job. Will definitely be buying again! This baking spray is just as good as the higher priced, big named baking sprays. The only thing I don't particularly like is that it discolors my baking pans that I've also purchased from Webstaurant Store as the other baking sprays did not! But that's an easy fix. Just a little more elbow grease in cleaning them up. Would definitely purchase again! A terrific product and a wonderful price for a baking release spray. The Baker's Sprease in amazing and is great for all of our baking needs. The spray nozzle is great and really gets into every crevasse. we tried this instead of our normal pam brand spray release grease and it also work just as well a pam brand. its a little cheaper then pam also. Excellent product, before use these I baked with Pam and I have to spray a lot, and 1 bottle work for me for one week. Whit Sprease you just need a little bit and perfect results. Baker's Sprease 16 oz. Baking Release Spray is great for cake pans. I typically use a different spray for my cakes but found this as a great alternative. This spray is perfect for all your baking needs. We never have anything stick when we use it. It comes out evenly and sprays well. I used to buy Pam baker's spray but I thought given the reasonable price and size of this product, that I would give it a try. So far I have had great luck on my baked goods. It seems to accomplish the same thing which I am glad for. Works well, prevents sticking. I use it in baking, it doesn't require a lot, but it actually allows the food to release. Will purchase again. OMG! I love this baking spray!! When I first started using it I couldn't tell if my cakes were done because of the way it looks with the access foam from the spray but it doesn't effect the cake. I also may just have sprayed to much but this spray has my cakes coming out so clean I barely need to wash my cake pans after! Love, Love, Love! This is the best baking spray on the market! Large can is great value! Kids love the colorful design and are excited to bake with it. Though the price is great, I'm not a big fan of this baking spray. I think it has an off-taste that is noticeable after baking. Great baking spray. We use the spray for our 6 inch round cakes. Would recommend this product for anyone who needs a good release spray. The baking release spray is awesome and a great price. It is amazing and works great for baking our pastries and no worries about them sticking. Great baking spray.. no issues with anything sticking. Nice fine mist.. most attractive is the price. You get a larger bottle for a much better price than comparable products at the supermarket. I buy the cases of these and will continue to buy. Excellent product. We use Sprease for all of our cake pans, and it works great! It releases our cakes from their pans easily as well as doesn't leave any lasting residues in our pans. 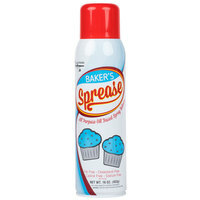 Baker's sprease is a wonderful baking release spray that is great for our kids scout bake sales. They are well priced and great for baking cookies. I was skeptical since it doesn't have flour in it, but it does a great job for half the price of the brand name stuff. A great value cooking spray that is great for non-stick cooking. The baking spray is great for cooking muffins and cookies and ensures easy transfer when they are done. No more stuck muffins and messy cookie sheets. A great product. I'm not sure how to feel about this spray! It works good doesn't stick my cakes to the pans but the only negative outcome of it for me would be the foaming of the oil that comes out the pan while the cake bakes. Other than that it is an amazing price for the size of oz that you get from this! The Baker's Sprease baking release spray is awesome for our muffin pans. The spray helps coat the pans for easy removal and no sticking. An awesome value. i absolutely Love this Baker's Sprease 16 oz. Baking Release Spray. Nothing sticks, Our protein muffins and donuts slide right out of the pans! Perfect product. Works incredibly well. I haven't had any bread or baked goods stick to the pan even with using just a small amount of this product. This stuff works great! I'd say just as good as bakers joy or better. It doesn't leave a weird residue on my cake, and it doesn't come out smelling weird. This sixteen ounce can of Baker’s Sprease Baking release spray is a winner. The taste is remarkable for it being a spray and the consistency is the perfect addition to any muffin pan. I like how easy this release spray is to order and will continue to do so. The fast shipping and quantity discounts are a huge plus. I was a little surprised at how fast the can disappeared. This baking spray does exactly what the description says. Saves time when a recipe calls for greasing and flouring the pan. It works as described. Bakers sprease is a decent overall product for the price, however, I have found that twice the amount of product is needed to accurately release the product. A decent product for the price and will purchase again if I am doing smaller amounts of pastries. A very nice baker's spray that is perfect for keeping the batter of my muffins for sticking to the pan. It is amazing and does not alter the flavor of the muffin like some sprays with bad tastes. I have used this Baker's Sprease for my bread loaf pans and I'm in love!! The loaves practically fall out of the pan and there's no odor or taste with this product. I hand wash my loaf pans and couldn't believe how quickly and easily they came clean. The can is huge and I can't wait to try it for my other baked goods. I like this for normal baking products but not so much for wedding cake layers. It seems they have tend to maybe have too much moisture and don't hold up well. Each layer developed a" bulge" when turned out after cooling. It may be something else causing it but this was the only change I had made. This is OK for coating cake pans, but I prefer a different brand. I'm not fond of the sprayer on this product. I think the other brand puts out a finer mist with less clogging. In a pinch it wil do but definitely not my favorite. A great price for a large bottle of baker's sprease. The spray is perfect for all your baking needs. It is great to spray on cake pans or muffin liners. Excellent product. I had my doubts when I saw it didn't contain flour the way that most baking release sprays do, but I tested it out in the pan of a notoriously sticky cake, and the cake slid out with barely a crumb left in the pan. I'm a believer! Also, not having flour in the spray is actually a blessing because my old flour + oil sprays always got clogged from flour drying in the nozzle, so this is even better than those. And it's a huge can! I was initially a little hesitant about using this spray as it has no flour in it. However, it really does release the cakes just as well as sprays with flour in them. Pan prep is a snap with this spray! Economical great value product. I spray my cake pans with this and the cakes never stick even though I use aluminum cake pans which are not nonstick. This baker's spray release is a great product from WEBstaurantStore perfect for keeping cakes and things from sticking to the pan wonderful price and quick delivery from w.
Definitely a winner when it comes to baking sprays. Even, thin spray with amazing nonstick properties. I've always relied on Baker's Joy sprays for baking, but now I don't think I can go back. great baking spray added nothing to the product when cooking. has no extra things in it. has no fancy smell or taste to if so was just a great easy product to use! Don't risk losing your cakes due to not having a quality product to make sure it doesn't stick. Use this to keep your product from sticking and save your self time and money. Coats surfaces evenly. Spray is continual. Baked products release from all of our pans quickly and easily. This product is easy to use and great for our needs. Great product! I've never had a cake stick to the pan when using Baker's Sprease....especially heavy chocolate mud cake! It also doesn't leave that residue on your pans like other brands. I have been purchasing another brand from a bulk club until I starting using this baking release spray. Now, I won't even finish using the other pan spray. It has to be Baker's Sprease every time! No more sticking! I love using this nonstick for all of my baking needs! It works wonders on cookie sheets and cupcake, brownie, and cake pans. Great product. Got it today and already went through it doing our baking. The vegelene last a lot longer than this stuff. Does have a nice release. This baking spray works wonders for our fresh baked breads and cookies! The can is easy to use and effective in getting the job done. I'm happy with the quality, but the spray pressure is a little strong, so i have to get used to not pressing down as hard or there is was too much spray coming out. Cakes definately released easy from the pans/parchment paper using this spray, compared to another brand.